As I sit down to write my review of Joy Organics CBD Oil, I’m in need of focused energy to compile my notes and tell my story. I remember I have ONE more packet of Joy Organics CBD Energy + Focus Drink Mix (Happy Berry Flavor…YUM!) and gladly mix half the packet into a glass of cold water. 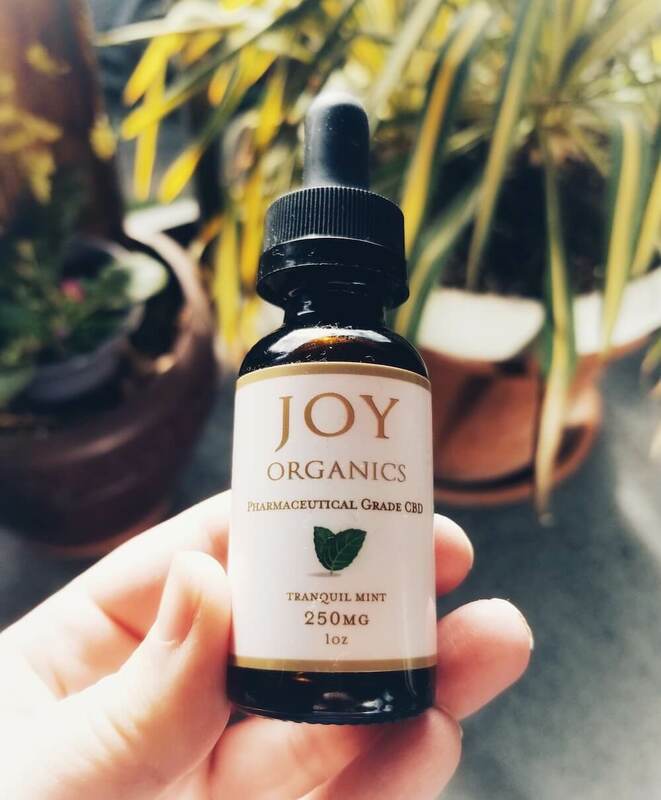 As I hunker down to get this review of Joy Organics CBD Oil written, I’m reminded of how much “joy” I felt using this CBD Oil, and it’s my hope you get to experience the AWESOME benefits of Joy Organics CBD Oil, too! Disclosure: I received a complimentary sample of a few Joy Organics products in exchange for my review. There are affiliate links in this review, and if you click and happen to purchase, I may receive a small commission at no extra charge to you. I only recommend products that I either use or feel would be helpful to you. Joy Smith, founder of Joy Organics, started her company because she wanted a natural solution to help with her pain. Joy was finding that the CBD industry was full of not-so-good-products, and after trying seven of the biggest CBD brands, she decided to start her own CBD company. As a woman entrepreneur dealing with my own pain, I resonated with Joy’s story and couldn’t wait to try out her CBD Oil. You can read more about my story here. For the last several years I’ve been dealing with deep muscle pain in my legs and most recently developed arthritis in my knee (at the ripe age of 44). Certainly I am TOO young to be living with this type of pain, so I knew I needed to act fast. Like Joy, I also look to natural remedies to help ease my pain. I don’t take any prescriptions, and I rarely take any over the counter pain reliever unless absolutely necessary. As of late, it was becoming necessary. If managing pain was going to be a lifetime commitment, I knew I wanted something natural that would not harm me. I decided to give Joy Organics a shot to see how well it relieved my pain and I was pleasantly surprised! Before taking CBD, I used to have difficulty getting out of bed because my knee wouldn’t bend. Now my life is a complete 180 – my knee bends easily and without pain. My pain in my legs is almost non-existent. I literally have my life back! I received a complimentary sample package of Joy Organics CBD Oil Tincture (Tranquil Mint flavored 250 mg bottle). I also received several packets of Joy Organics CBD Energy Drink Mix and Joy Organics CBD Softgels (25mg per pearl). I spent 12 days documenting my results from using some of these products from Joy Organics and the results are nothing short of amazing! I kept a CBD dosing diary and documented my daily doses as well as the effects I was experiencing. Here is the sample of lovely products I received from Joy Organics! Achey and tired muscles in my arms folding laundry. Deep muscle pain in my quads (legs) making it difficult to stand up from a sitting position, among other things. Joint pain in my knees making it difficult going up and down stairs (same knee where I experienced arthritis). I lived with pain for quite a while, so it became a part of life. It’s sad, but true. You learn to deal with chronic pain when diet and supplements don’t work as much as they used to, or when you’re exhausted from trial and error from different remedies. Taking CBD Oil for pain has been a life-changing moment for me. I’ll explain in further detail the specific changes in pain I experienced taking Joy Organics CBD Oil, so keep reading. But before then, let’s talk about dosing because it’s important to get it right. How Much CBD Should I Take in a Day? By the time I tried Joy Organics CBD Oil Tincture, I had already been experimenting with other CBD Oil brands and getting my dosage just right. If you’re trying CBD oil for the first time or you’re trying out a new brand, I always suggest first reading the manufacturer’s label for their recommended use. Joy Organics recommends one to two droppers, as needed, for their 250 mg Tranquil Mint CBD Oil Tincture. When I decided on a proper dosage to start with, I chose .75 ml (3/4 of a dropper). This equates to roughly 6.24mg of CBD per dose and I dosed twice a day for a grand total of 12.48mg. Rather than start with a higher dose, consider two smaller doses during the day/evening as CBD generally stays in your body for about 4 to 5 hours. As a general rule, it’s always best to start low and dose slow. Too much CBD produces a biphasic effect, meaning you get the opposite result (i.e. too sleepy instead of energetic). So as you can see, it’s important to get the dosing right for you so you can fully feel the effects of CBD. When you’re first starting out with CBD Oil or using a new brand, it’s always a good idea to keep detailed notes of the changes you’re seeing as well as your daily dosing. Keep track until you get your dosing just right so you have historical data to review if adjustments are needed. For instance, I had my dad try CBD Oil in the past (different brand) for his trouble sleeping. He didn’t keep track of anything. When I asked him how it was going, his usual response was, “It’s not working”. He still wasn’t sleeping. After I asked him a few more questions to prompt him to think back on any changes he may have experienced, he thought about it some more, he decided it was working! Now, he wasn’t necessarily sleeping better, but his joints no longer ached and that was a huge win for him! The point of this story is this: pay attention to ALL of what you’re feeling and the changes you’re experiencing. If you’re experiencing pain and you have a few good days that are pain-free, this is likely due to the effects of CBD. If you’re not experiencing any changes, take a look at your dosing to see if you need to up your dosage or add in an extra dose per day. If you’re experiencing changes not necessarily related to the reason you’re taking CBD in the first place, track these changes. All changes mean it’s working on some part of your body! You can’t measure what you don’t track. Here’s my dosing diary when I used Joy Organics. This is my homemade dosing diary to help me keep track of daily doses and changes I was seeing using Joy Organics! When looking back in my first day’s journal entry, I took my first dose of .75ml at 9:02am and by 10:20am, the pain in my knee was GONE! Even better, I had so much energy that day that I swept the kitchen floor during lunch – this isn’t something I had done in a while because I was in so much pain or lacked the energy to clean! By 3:20pm my first day, I mixed half a packet of Joy Organics CBD Energy Drink Mix with 16oz of cold water and had a wonderful rest of my day! On my second day of using Joy Organics CBD Oil, I recorded in my journal that I had the best sleep the night before. In fact, I had slept through the ENTIRE night. This never happens to me! By day 2, I had no pain! It’s so important to track changes – every little thing counts! By day 4, I was enjoying lunch at the park for over 2 hours. An afternoon stroll around the lake was easy and pain-free! There’s no question in my mind that I owe these results to Joy Organics CBD Oil. CBD Oil effects people differently. A lot probably depends on your age, genetics, level of pain, general health, dosage requirements and the brand you’re using. So when you’re using CBD Oil and figuring out if you’re experiencing changes, pay attention to every single change. I mention above, the pain in my legs was gone by day two. Because CBD affects everyone differently, you might have a different outcome than I did. For instance, even though I was pain free on day 2, on day 5 I experienced some pain early in my day after I had taken my first dose. Because I was experiencing pain early in the day, I took my second dose earlier than I normally would. So you won’t necessarily have the same outcome as me, or you won’t necessarily experience the same effects day in and day out. You might have good days and not-so-good days. Take it one day at a time, and add in an extra dose if you’re having an “off” day. At the end of the day, CBD will likely change your life! I had an awesome experience using Joy Organics CBD Oil. Even though I only documented 12 days worth, I continued to use the CBD Oil Tincture as well as their CBD Softgels and kept getting great results! I’ve tried isolates in the past and experienced good results. Joy Organics uses a full spectrum hemp extract, and because I’m getting the benefits of terpenes and other nutrients from the plant, my results have been even better! If you’re going to try CBD oil for the first time or changing brands, definitely take advantage of a full spectrum hemp extract and its benefits! CBD is legal in all 50 states as long as the THC level is 0.3% or lower. However, there are people who don’t want any THC at all in their CBD oil for various reasons. The great news about Joy Organics is that they produce a full spectrum, 100% THC free CBD oil. Rather than use potentially harmful “natural” flavorings, Joy Organics uses essential oils to flavor their CBD Oil. Generally, I like to use an unflavored CBD Oil because you never know what ingredients are used for the flavoring. However, in this instance, Joy Organics uses Peppermint Oil to flavor their Tranquil Mint CBD Oil Tincture. The quality of the carrier oil is really important. Joy Organics uses both hemp seed oil and grape seed oil as their carrier oils in their Tranquil Mint flavored CBD Oil Tincture. Joy Organics also uses MCT oil in a few of their other flavored CBD Oils. Joy Organics has always internally tested their products, but recently began using a 3rd party lab to test their products and I think this was a great move to provide more transparency. Joy Organics is committed to always utilizing 3rd party labs for testing the safety of their products and confirming label claims of potency. Joy Organics makes it super easy to figure out dosing with their graduated dropper. As you can see, the measurements are clearly marked, so you can’t get it wrong! Joy Organics uses graduated droppers to make dosing CBD Oil a breeze! Joy Organics is taking advantage of their water soluble nanoemulsion technology to deliver an increased bioavailability up to 300% over an oil-based CBD product. This is cool! I’m not a big science person, but the science of this technology is AMAZING! Here are two of the 25mg CBD Softgels – what a beautiful amber color! There are so many different brands you can choose from when it comes to buying CBD Oil. I’ve tried many and Joy Organics is one of my top picks for sure! If you’re a first-time user, any of their flavored CBD Oil Tinctures are great. If you want to save money while learning your personalized dosing, Joy Organics has a 250mg strength CBD Oil that is a perfect price point for beginners figuring out their proper dosage. If you enjoy vaping and love feeling the effects of CBD at a much faster pace than traditional CBD Oil delivery, Joy Organics has a rechargeable vape and cartridge for sale. Overall, my pain decreased by 85 to 95% when using Joy Organics CBD Oil Tincture. Some days I felt no pain at all. Amazing, right? In addition to relieving my pain, I also experienced increased energy, and noticed inflammation was reduced as well. I also enjoyed Joy Organics CBD Energy Drink mix. I used half a packet at a time with 16oz of cold water. The drink mix gave me focused energy to get stuff done, including this review! Lastly, the Joy Organics CBD Softgels are a lifesaver! While I didn’t try them during my 12-day documented trial, I used them at a later date (what can I say….I was saving the best for last!!). They provided relief within a half hour and lasted all day long! As a thank you for reading my review of Joy Organics CBD Oil, I am excited to offer you a 10% discount off your purchase of Joy Organics. With each CBD Oil Review I publish, I'll reveal how each company measures up to my 5-Point Checklist. When you're ready to buy CBD oil, you can make your own assessment at that time as results may vary from harvest to harvest and/or changes in company production. How did Joy Organics do on the 5-Point Checklist from Simply CBD & Me? It's always a good idea to conduct your own research and due diligence when choosing to buy CBD Oil. The results of this checklist may vary by harvest and/or production and may not necessarily represent the oil you buy at the present time. Joy Organics CBD Oil Tinctures, CBD Softgels and their CBD Energy Drink all get my Top Pick for high quality, transparency and overall effectiveness! Would you like to save 10% on Joy Organics' CBD Oil? Yes, I want to save some $$!